Arachnos is an effort by BootanSoft that is reminiscent of arcade shmups from the early 80's. I could not get this to work full screen, but changing to a lower desktop resolution helps. Controls are shown under the configuration menu. Set BLT scale to double for a larger game display window. 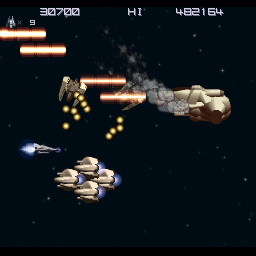 The graphics may appear to be bland but does improve after the second level. Several weapons most commonly found in Konami's classic shooters make their appearance here, such as ripple lasers and options to name but two. Your ship does not explode immediately when hit, allowing options to be recovered after the loss of a life. 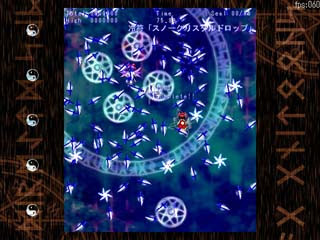 Asougi is a freeware vertical shooter that resembles ESP Ra.De., a Cave arcade favorite featuring characters with the ability to fly and amazing psychic powers. 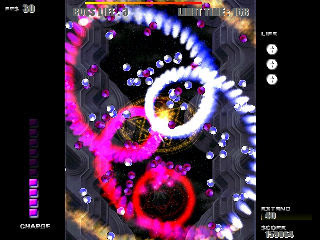 Some of the bullet patterns are rather unique and not the sort commonly found in recent shmup releases. It's also rather friendly to beginners as the number of continues are set to unlimited, though progress past stage three is only allowed to players using three credits or less. The executable file with a longer name is the version with less effects for slower computers. Press the Z key to shoot and use the V key to bring up the pause menu. There are only four stages in this trial version, unfortunately. The 70MB file package may take a while to download, but rest assured that it's one shooter well worth the effort especially for fans of Treasure's classic. Note: the color change button has to be remapped to C again using the in-game control setup option. FLAT updated the demo recently and messed up the original key configuration setting. Press the Z key to shoot, X key to charge the special weapon, and C key to switch between two forms. Use the A key to activate autofire. You can change settings, like windowed vs fullscreen and whether it uses vsync, by editing the init.txt file. Guxt is a new vertical shooter by Pixel, the famed creator of Cave Story and Ikachan. Click on the first text to download. Use the arrow keys to move your ship, and tap the left control key repeatedly to shoot. Screen size can be adjusted by selecting the menu tab. A key configuration option is included as well. Power-ups can only be collected after you've destroyed their protective shells. Autofire is possible once your ship gains it's first weapon upgrade. 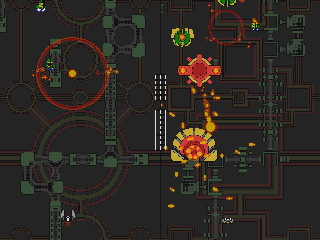 Hyper Wars: The Mega Firestorm is a vertical shooter by CK which uses only two colors throughout the entire game. There are plenty of power-ups to choose from and several bosses to defeat at the end of each level. The demo only showcases four stages, but expect more in the near future as development continues. La Soeur de Barrage is a pretty decent shooter with emphasis on boss fights and accessible controls. Use the mouse to move the character and hold the left button to shoot. There's plenty of save points and unlimited continues to assist beginners, plus a super easy mode has been included which allows the player to resume a game with twenty-four lives. Three long stages. 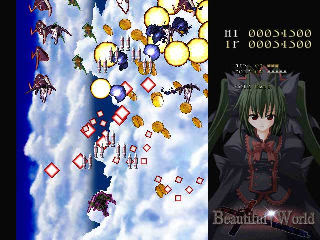 Touhoukokuhuugi is a pretty good Shoot the Bullet clone developed by President Room, requiring impossible bullet dodging and photography skills just to get past the first few levels. Take pictures by holding the Z key when your camera is ready, indicated by a percentage shown above the crosshair. Use the X key to make your character move slower, or press both buttons to charge your weapon faster. Only photos with bosses are considered valid. Still early in production, the game is very playable even without any background music or sound effects. Originally Shoot the Bullet was supposed to occupy this spot, but no demo was ever released so this decent substitute gets the nod instead. Virtual by Vector Games is a shooter with a mix of gameplay elements from Japanese shmups, Every Extend and Tron. Hard to imagine, but pretty fun nonetheless. When pressing the left control key, your ship will warp and create a small circle. Any round objects with the same color caught in it will basically go offline and disappear. Enemies leave trails when traveling, and your ship will be terminated if it crosses these lines with another color. Press the left shift key to change your ship's color. Lives are replaced with logins, which can be acquired by using the same warp action on square objects.